The traditional port promenade is brimming with fine restaurants and taverns to satisfy everyone’s palate, cafes and souvenir shops, housed in renovated pre-earthquake Venetian style mansions. By night, Fiscardo takes on an entirely different perspective. 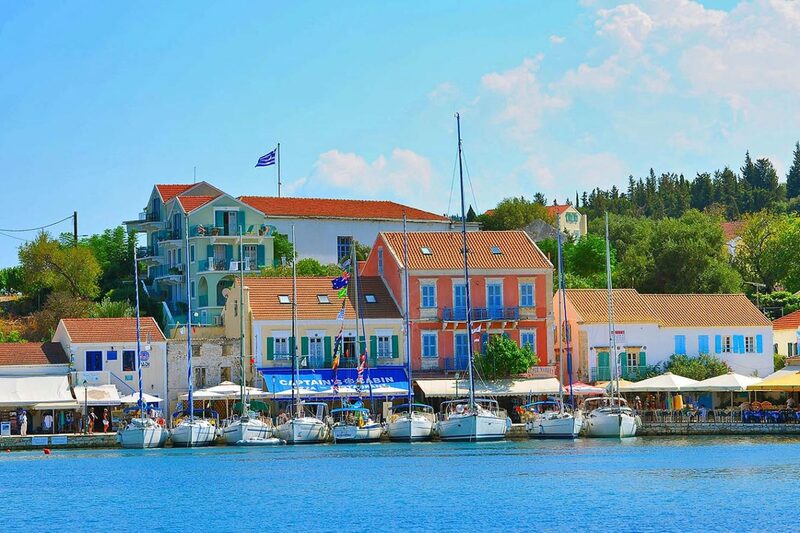 It is considered to be the most cosmopolitan spot in Kefalonia, the charming waterfront is lit up and vivid like a beehive. Alongside the port, one can see high-class, luxury sailing boats and yachts mooring next to traditional fishing boats. Surrounded by untamed, lush vegetation that almost reaches the coastline, the village of Fiscardo seems to be part of a dreamy landscape. It is a land filled with contrasts, where the rugged, heavily wooded hills (mostly cypress and pine trees, lesser olive trees) meet with the gleaming white-pebble beaches. Fiscardo is a cherished destination for celebrities seeking seclusion and anonymity. Also, some scenes from the Hollywood film “Captain Corelli’s Mandolin” where shot here.